RNIB, local sight loss societies and eye health professionals in the East Midlands are challenging Lincolnshire Clinical Commissioning Group's decision to remove low vision assessments last year. “In September 2017 it was bought to our attention that Lincoln CCG had removed low vision assessments. This type of assessment enables visually impaired people to make the most of their remaining vision through identifying suitable aids and support equipment that they might require in order to live independent lives. “There appeared to have been little consultation about this decision and many sight loss organisations contacted us about it. As the new RNIB East Midlands Network had just been put in place, we took this as an opportunity to develop links with all the other sight loss organisations and eye health professionals in the area. Rather than working independently, we have united on this issue. “We organised a meeting with all the interested parties including key members from Local Sight Loss Societies, National Groups such as Guide Dogs, Vision UK, Macular Society, Visionary and Blind Veterans UK. The meeting was organised and chaired by RNIB but all decisions were made as a group. “The first stage of the campaign was to send out letters to the CCG from each member of the group. Each letter was based on a template with the same message requesting a face to face meeting, but each member adapted their letter to give their specific feeling on the removal of this service. The letters were all posted on the same day and we are now awaiting a response. 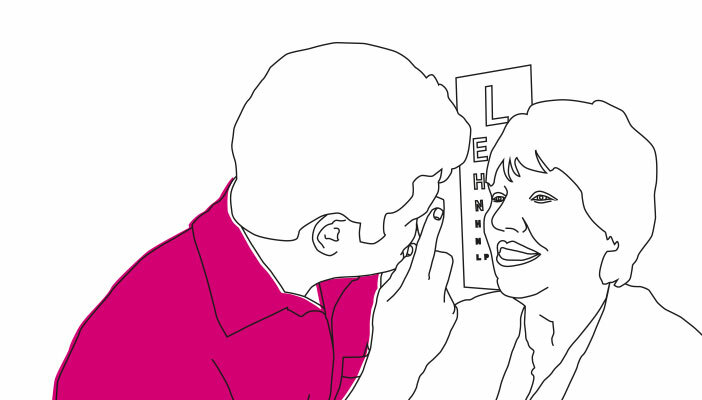 Learn more about RNIB’s See, Plan, Provide campaign calling for improved access to vision rehabilitation assessments and support. In October last year, the Clinical Council for Eye Health Commissioning produced the new Low vision, habilitation and rehabilitation framework. Find out more about low vision services and how they can help.